There's a tendency for some people to valorize soldiers and military service in contemporary American culture. That is to say, soldiers are viewed as heroes because, according to a patriotic narrative, they protect freedom and keep America safe. This idea is ubiquitous in our public discourse and cultural messaging, often informing our collective response to veterans, which is usually gratitude. Yet, when we valorize soldier service in relation to a patriotic frame, we become unable to imagine a more complex soldier experience in war and importantly, after war. Dear Madison is my attempt to throw light on this experience as opposed to the limited one portrayed in our patriotic narrative. In this project, which I approach ethnographically, I try to arrive at a different truth about war through the stories of some veterans (myself included) of our current wars. The idea of defending freedom and an American way of life are abstractions; the lived experience of people affected by political violence is concrete. It is the space between these two poles – the envisaged soldier life and the lived experience – which I explore in this creative project. So, in a sense, this project is about memory – a remembered war experience in opposition to the somewhat formulated memory claimed by a patriotic narrative and its public display. 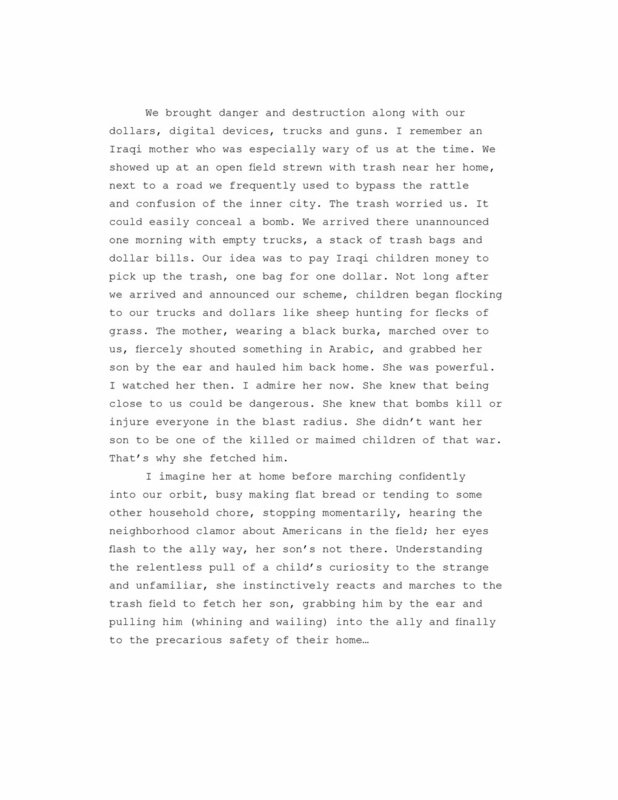 The title, Dear Madison, derives from a letter that I received when I was in Iraq from a young girl named Madison. This project is my response to her note, more than a decade late.